On creating my log in, I've noticed there's a section for a picture and a box titled "About" - can you tell me what this is for? FX Medicine is passionate about creating a community of like-minded members of the health and wellness industry. Therefore FX Medicine has created a way to build this community, through the ability to sign up for a website membership. Please note, that for now, this functionality offers no additional benefits outside of the regular website use - but it may in the future. So feel free to join as a member, or, if you prefer something more simple; use the sign up form on the FX Medicine home page and add your name and email to subscribe to the regular eNewsletter to stay up to date with the latest articles, podcasts, research and other information. Who can become a member of FX Medicine? Are there any requirements to becoming a member of FX Medicine? We've designed FX Medicine with health professionals in mind. That being said, we welcome membership from anyone who would like to become more informed on complementary medicine. For those who aren't health professionals, let us preface that much of the content may, at times step outside your realm of understanding as we explore clinically relevant topics including pathology, biochemistry, genetics, metabolism and disease to name a few. But dont let that discourage you! Please note, that for now, the membership functionality offers no additional benefits outside of the regular website use - but it may in the future. I notice that if you're a BioCeuticals member, you can use these details to access FX Medicine, does this mean I can also access the BioCeuticals website and order product? As a partner of FX Medicine, we have worked with BioCeuticals to provide dual access to their membership, so they can access FX Medicine with the same credentials. This is a one-way process. Members of FX Medicine, cannot use their username and password for the BioCeuticals website, nor will they be able to access practitioner information, or purchase product. Does FX Medicine share my information with outside parties? How to do I cancel my membership? To cancel your membership, including your log in and all account details contained within your profile, please contact us, and we will take care of this for you. Once the information is deleted, it cannot be retrieved. How do I subscribe to the Podcasts? How do I subscribe to the Podcasts, so I never miss them? To subscribe to the Podcast, you will need to have an iTunes account. 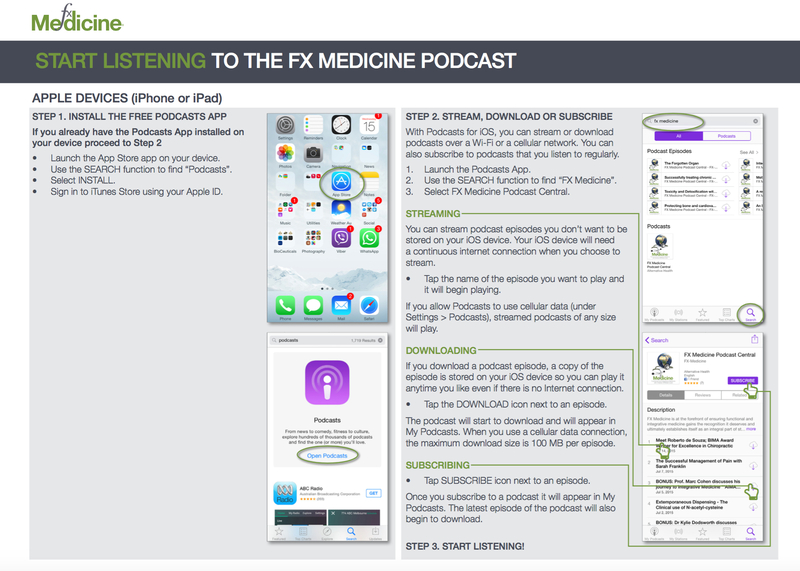 If you're on a laptop or desktop computer CLICK HERE to be directed to FX Medicine Podcast on iTunes to become a subscriber. 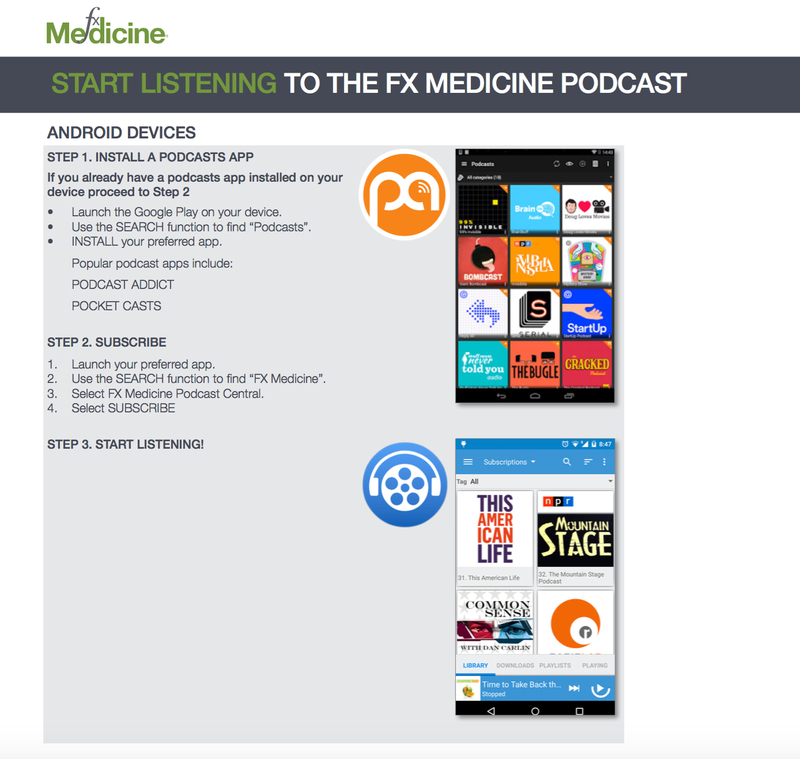 If you would like to use the FX Medicine Podcast Player (such as below) please get in touch with us for the applicable source code. You can get in touch with us directly for more information.